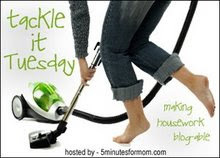 For more tacklers, go to http://www.5minutesformom.com/ and feel free to join in yourselves as well! Those are some big tackles you have in your future!! Best of luck with them. Love the new template~ so spring like! I know this weather is helping me accomplish things, too! WOOHOO! I can just feel an urge to tackle some project in my home. Delighted to meet you. I hope you don't mind if I splash around a bit (i'll clean up any messes) to get to know you a bit more. Well, you've got alot of stuff done, that means your back is feeling better each day. Once again the Lord is faithful in taking care of you. Isn't He awesome? I'm gonna be doing major cleaning next week after my daughter goes back to school and before my sister comes to visit. Meanwhile I'm enjoying having my kids at home. Love the Easter/springtime look on your blog too!